This enameled cast iron fondue pot has the aesthetic of the traditional fondue pot, so it’s great for traditional cheese fondue meals. The sturdy cast iron pot retains heat well and can be used right on the stove, so you don’t need to dirty a second pot to melt the cheese and then transfer it. The stand is made from wrought iron and holds a gel container that provides the heat. The six included fondue forks have three tines instead of the more common two, so they hold food a little more securely. The set includes one 3-ounce fire-gel container to get you started right away. The enamel coating in the cast iron pot means that the pot doesn’t need to be seasoned before use, but nonstick or wooden utensils should be used for cooking the fondue. It should be hand washed. The pot can be used on any heat source. The pot is two quarts, so it will be useful even after the fondue is over—you can use it for warming sauces or heating milk for hot cocoa, and it’s attractive enough for serving. While this looks nothing like a traditional fondue pot, it’s perfect for fondues as well as for holding and serving other warm dips at a party or on a buffet. The cooking insert and lid are both made ceramic. The insert is removable for easy cleanup, and both it and the lid are dishwasher safe. This holds 1½ cups, so it’s great for small dinners, or for appetizers, or it can be refilled as needed. The stainless steel exterior will look good on the table and it’s easy to wipe clean. With this warmer, it will take 30 to 60 minutes to heat ingredients in the pot, so it might be faster to heat on the stove, and simply use it for serving. This warmer doesn’t include fondue forks, so they’ll need to be purchased separately. Since this is electric, you won’t need a separate heat source. This gorgeous fondue set will look stunning on your table and just as good on display in your china cabinet when it’s not in use. It includes a 1.6-quart fondue pot with handles, six forks, a splatter ring, a stand, a fuel burner and a grooved wooden base. The pot is made from enameled cast iron that retains heat at both low and high temperatures, so your fondue will stay at a consistent temperature while you dine. You can heat the pot on the stovetop or in the oven, then keep it warm on its stand once it reaches the proper temperature. Three sturdy legs keep the pot stable and provide easy access to the paste or gel fuel below. The wooden base holds everything securely and protects your table from drips or spills. While it’s designed to be ideal for meat fondues, you can also use it for cheese or chocolate. When you’re not making fondue, you can also use this for soups, hot dips, sauces, gravies, and also use it for stovetop or oven cooking. This comes in a variety of colors to match your décor. Attractive and functional, this fondue set includes a porcelain-enameled cast iron pot for excellent heat retention, and it has a splash protector ring for safety. The six included fondue forks each have different color on the end so everyone can tell which fork is theirs. The flame burner is adjustable so you can make sure the chocolate or cheese stays melted, but doesn’t burn. A flame snuffer is also included so you can easily and safely snuff the flame when you’re done serving. You can use either solid fondue gel or methylated spirits for fuel depending on which you prefer. While an electric fondue pot isn’t traditional, it’s certainly convenient—and this fondue pot is also very attractive. It has a brushed finish on the bowl and ring, and a mirror finish on the stand and handles. The ring has notches to hold the forks in place. This pot can be used with any type of fondue, including oil, broth, chocolate, or cheese. Temperature is controlled with a dial with eight different settings. Foods can be heated right in the pot—no need to heat anything on the stove first. For oil cooking, it takes 10-15 minutes to reach 375 degrees Fahrenheit. The bowl is three quarts and has a nonstick coating for easy cleaning. After removing the temperature probe and cord, the rest of the components can be washed in the dishwasher. Eight fondue forks are included, so this is perfect for larger gatherings. While this is designed for fondue, you could use it for keeping soup, stew, chili, or other foods warm for serving as well. If you love chocolate fondue, why not have a fountain of chocolate? This holds up to two pounds of chocolate, so it’s perfect for parties and events. The heated stainless steel bowl looks good and keeps the chocolate flowing at the proper temperature with an auger that moves the melted chocolate upward and ready to cascade down. There are separate switches for heating and for the motor. When you’re not using this for chocolate, you can use it for cheeses, sauces, and more—try it with barbecue sauce for your wings and ribs! The four tiers are easy to assemble for use and just as easy to disassemble for cleaning and storage. 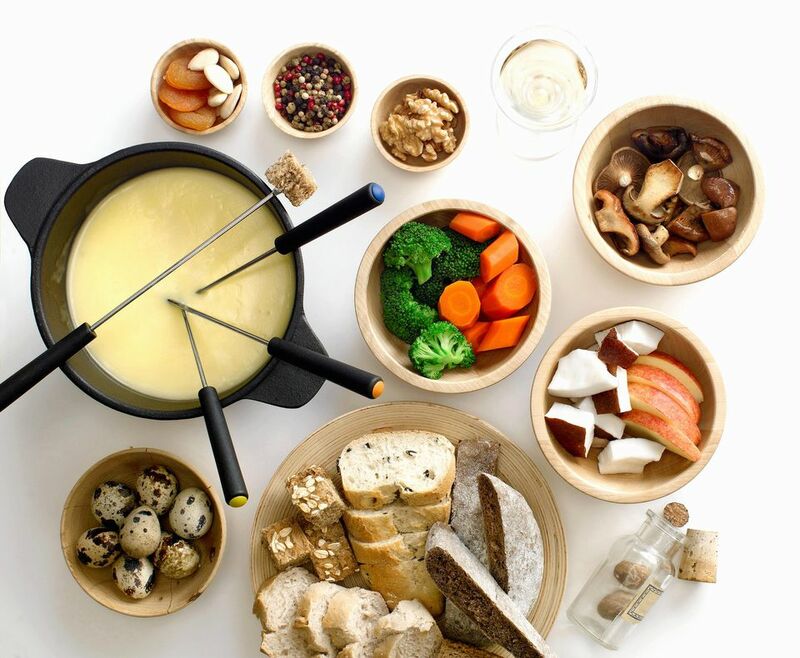 While cheese and chocolate fondues are quite common, fondue pots that can handle the high heat of cooking meats are less common—and those that can handle the heat sometimes overcook and burn cheese or chocolate. This one can handle all three with ease. The pot holds 84 ounces, so there’s plenty of space for hot oil, but this also includes a ceramic double-boiler pot for cheese and chocolate that fits inside the metal pot. Water in the metal pot shields the ceramic pot from excess heat and even heating when cooking chocolate or cheese. The electric base has a thermostat to control the 1500 watts of power, so you’ll have plenty of heat for cooking in oil or broth. It has an easy-release power cord for safety. This includes 6 fondue forks. Designed for cheese tapas or fondue, this short, square pot comes with a wooden stand and a metal ring to hold the tea light that warms the pot. This includes four forks and comes with one tea light for the first fondue. While this isn’t a classic fondue design, it works the same way. The small size makes it great for fondue as an appetizer or for a tapas dinner. Or set up several pots with different cheeses for a party. While this is designed for cheese, it can also be used for chocolate. The ceramic pot is dishwasher and microwave safe.